Group tours can be scheduled any time between 1:00 p.m. and 5:00 p.m. throughout the week except Fridays, as long as they do not conflict with Masses, weddings, or funerals. Group tours can be as long or short as desired. Generally, tours last approximately one hour, although arrangements can be made to shorten/lengthen your visit. To schedule a Group Tour, contact Dianne Bosinski at (716) 828-9424 (or via email). Please allow ample time when calling to schedule a tour. We will do our best to accommodate all requests. 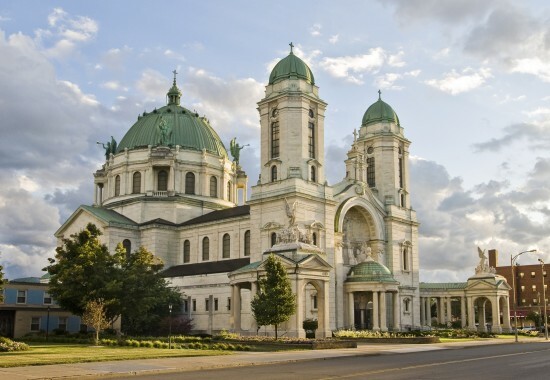 Tours of the breathtaking OLV Basilica are free of charge, although donations are accepted and go toward offsetting the cost of ongoing renovations and maintenance. Ample parking is available behind the Shrine and is accessible off of South Park Avenue (Rte. 62). The Basilica is wheelchair accessible.